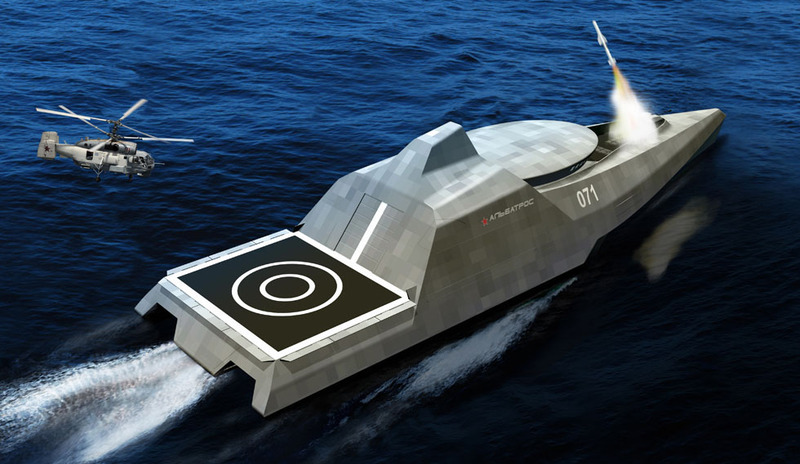 Corvette Albatross – a multi-purpose high-speed trimaran, combining capabilities of missile and artillery, anti-aircraft, anti-submarine and anti-mine ships. Designed for the protection of state borders, security of navigation, antiterrorist protection, for sabotage and intelligence operations. 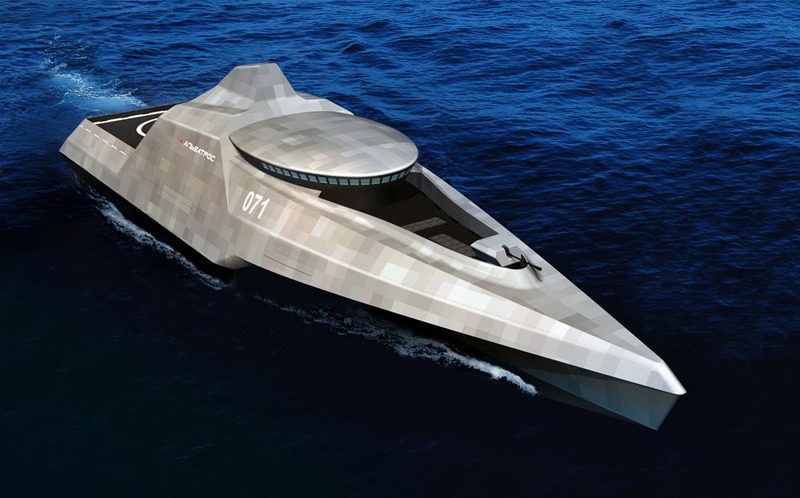 Rapid contours of the ship are based on the Stealth technology. Armament, radar installations and speed boats are hidden behind special screens. Body shapes are simple and practically feasible to produce. 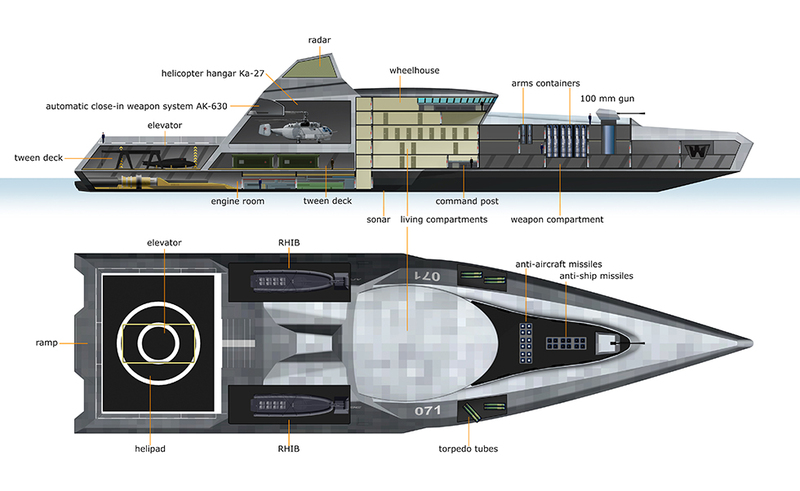 The trimaran has larger inner space, compared with a conventional ship of the same length. This advantage allows to increase crew’s cabins, install more weapons, place additional equipment in the spacious cargo compartment (drones, mini-submarines, etc.). A silhouette of the ship resembles the head of an albatross – a noble sea bird. Deck is made oval in plan, large windows with reverse tilt provide excellent visibility. Artillery gun on the bow as though dissecting the hull, forming a high railing of the deck in the form of waves. It hides the crew on the deck from prying eyes. 1. The weapon compartment in the bow, designed for assembly of standardized shipping containers with weapons (anti-ship and anti-aircraft missiles). On both sides are installed the torpedo tubes, on the deck – 100 mm gun. 2. The wheelhouse and living compartment located in the central part of the ship. At the bottom of the compartment is the second command post. 3. After the living compartment follows a spacious helicopter hangar. On both sides of the hangar located speedboats compartments. 4. The superstructure of the ship completes the radio-mast with integrated radar installations. 5. In the corners of the superstructure is a pair of 6-barrel automatic antiaircraft guns. 6. In the the stern is the engine room, over him tween-decks, equipped with a crane beam mover for launching boats or submarine through the stern opening. 7. Helipad equipped with a hatch with a lift for the tween-deck. 8. The underwater hull has a sonar station, which can be pulled out in the central part. In the stern part is possible to use the towed sonar. МNaval ship is the face of the state, the symbol of power, the country's sovereignty. Continuing the tradition of the Russian Navy, the corvette Albatross is a vision of the future naval ship, that capable to successfully represent Russia as a great sea power. Propulsion 2 gas turbines, 1 diesel engine, 3 water jets. 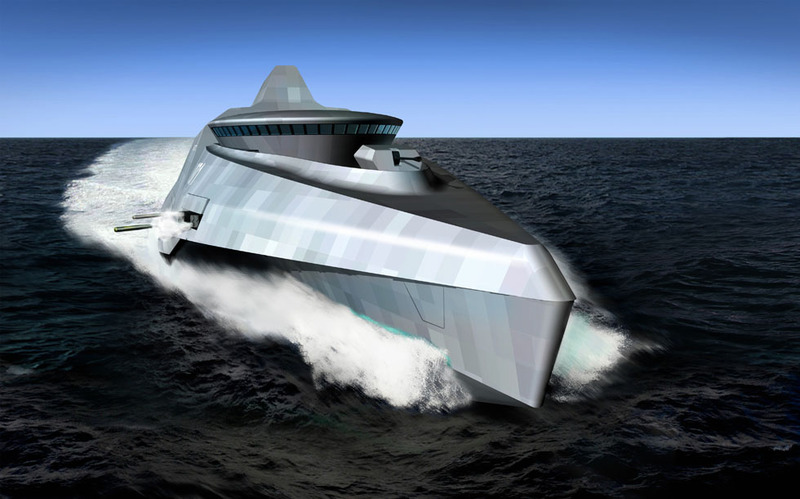 Total power 50000 h. p.
The project was developed as part of a design competition organized by the United Shipbuilding Corporation.